Robinette (foreground, left) and Tibbs in the main parlor before Friday night’s panel. Click image to enlarge. 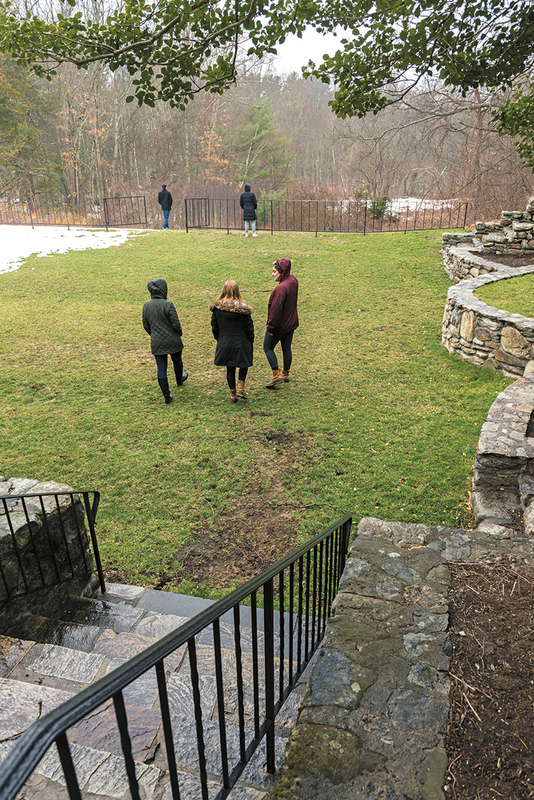 Friday, 5:00 p.m. On an afternoon in early spring, 33 students sat in silence on a yellow school bus taking them from Boston College to an 80-acre property in the woods of Dover, Massachusetts, 12 miles west of Gasson Tower. 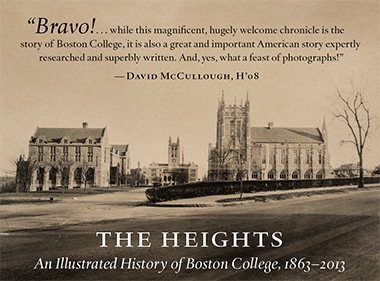 There, in a former family mansion turned Dominican Priory that is now Boston College’s Connors Family Retreat and Conference Center, they would spend a weekend participating in the 88th rendition of a retreat called Halftime. Started by the University in 2001, Halftime asks undergraduate students to set aside friends, textbooks, Netflix, and cellphones (most of the time) and focus—for 45 hours—on who they are and who they want to be. “Halftime isn’t an adrenaline rush. Halftime is a plate of broccoli,” says Michael Sacco, director of the Center for Student Formation, the office within the Division of University Mission and Ministry that runs the retreat. “What Halftime offers,” says Sacco, “is a chance for students to slow down, to really pay attention to their talents and desires, and to break down the pressures they feel about the future.” Today’s average 18-to-33-year-old American, according to research published in the science journal PLOS One, checks his or her phone 85 times a day, an investment of approximately five hours. “This generation wants and needs formally carved out time to disconnect and make meaning of their lives,” says Sacco. Halftime’s origins trace to 1999, when the Indianapolis-based Lilly Endowment offered to help liberal arts colleges and universities launch programs for students to “examine the relationship between their faith and vocational choices.” A team of some 20 Boston College faculty and administrators, led by Joseph Appleyard, SJ, ’53, Ph.L.’58, H’12, then vice president for the division of University Mission and Ministry (founded in 1998), drafted a proposal that would fund ministry internships; run monthly seminars to educate faculty and staff on the University’s Jesuit, Catholic mission; and host retreats at which faculty would speak to students about decisive moments in their own lives and so lead students to consider life decisions they had made and still needed to make. Lilly granted the University $2 million. The internships and seminars ended within a decade. Halftime, however, lives on. Originally intended for students during the summer between sophomore and junior year—hence Halftime—the retreat now takes place at least twice each semester and is open to all undergraduates. More than 700 faculty and staff have participated to date, along with some 4,000 students. Click image to view a slideshow with captions. The students on the bus looked out the windows, earbuds in place, perhaps enduring what Student Formation staff—many not a great deal older than the students—call FOMO (Fear Of Missing Out) on a weekend’s worth of campus life. Two registered students never made it to the bus or responded to queries from retreat staff. As frequently happens with overbooked students, a few others had cancelled, to instead attend a popular annual dance competition. Of those on the bus, nearly half had already participated in one or more of the dozen other Mission and Ministry programs on the Boston College retreat circuit—including 48 Hours (to help freshmen make the transition to college) and Kairos (an exploration of Christian faith). Some had what Sacco calls the “retreat bug.” Others told me they hoped Halftime might help them choose a major, or decide on a career. Few students in the schools of management or nursing attend Halftime. “We mostly attract humanities majors, students who don’t have clearly scripted paths ahead of them, and want to find a path,” says Sacco. Brian Kusior ’19, a soft-spoken, bespectacled music major from upstate New York, told me he was most looking forward to escaping for two days from his “chaotic” nine-man suite. All students at Dover would be upgrading from a twin bed to a queen, from a busy campus to a sprawling, 50,000-square-foot country house in a setting of snow-covered lawns, groves of trees, and a stone-walled garden designed in 1902 by Frederick Law Olmstead and Calvert Vaux. Halftime is a strongly choreographed dance of conversation, silence, attending, performance, walks in the woods, and meditation, and is centrally designed to foster “vocational discernment,” says Sacco. Directed by a carefully selected faculty or staff emcee, and assisted, as needed, by the staff from the Center for Student Formation, student, faculty, and staff participants explore “Three Key Questions” that were conceived by theology professor and award-winning teacher Fr. Michael Himes. What brings me joy? What am I good at? Who does the world need me to be? They also consider the “Three Be’s of Jesuit Education,” devised by Appleyard. Be attentive, be reflective, be loving. Students participate in 15 meetings over the course of the retreat: 10 plenary, and five within assigned groups of four or five students who are guided by junior and senior students, or leads, one for each group. Each group—there were seven at this Halftime retreat—also includes a faculty or staff member, referred to as a sweep. (The lingo of leads and sweeps comes from hiking.) The lead, says Sacco, “hacks away the brush, decides where the group goes, asks the questions” (Who in your life challenges you to be a better version of yourself? What prevents you from giving more of yourself to others?). The sweep is a “wisdom figure who hikes in the back in case someone twists an ankle or needs company while they walk at a slower pace.” Both sweeps and leads serve as volunteers. Sweeps speak in the small groups, offering encouragement or their own stories when they feel it appropriate. Sometimes they break silences that have grown too long. They also present two panel discussions. They are invited to take part in the retreat by Student Formation staff. Many are repeat visitors. The leads, half of whom are former participants, have trained for two months with Student Formation staff. 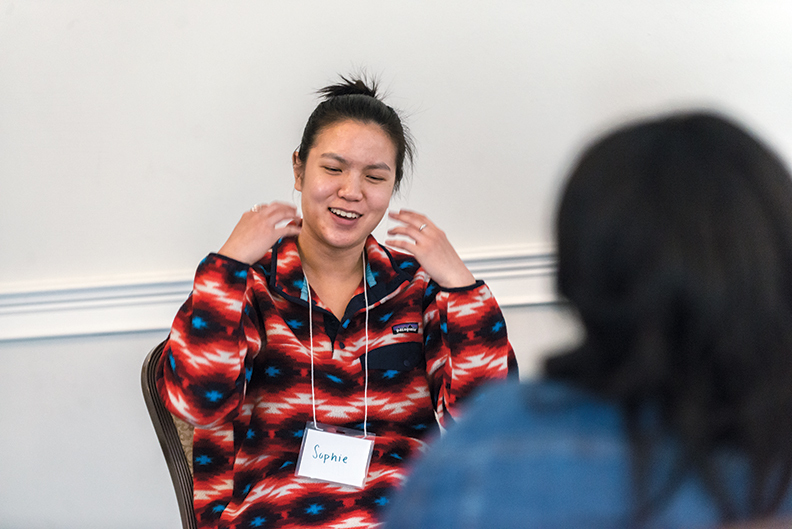 In addition to working with the small groups, each will speak at one of the plenary meetings, telling a rehearsed eight-minute story of moments of decision in their young lives. 6:00 p.m. Students, leads, and sweeps first gathered in their small groups at a dinner in a brightly lit basement dining hall. 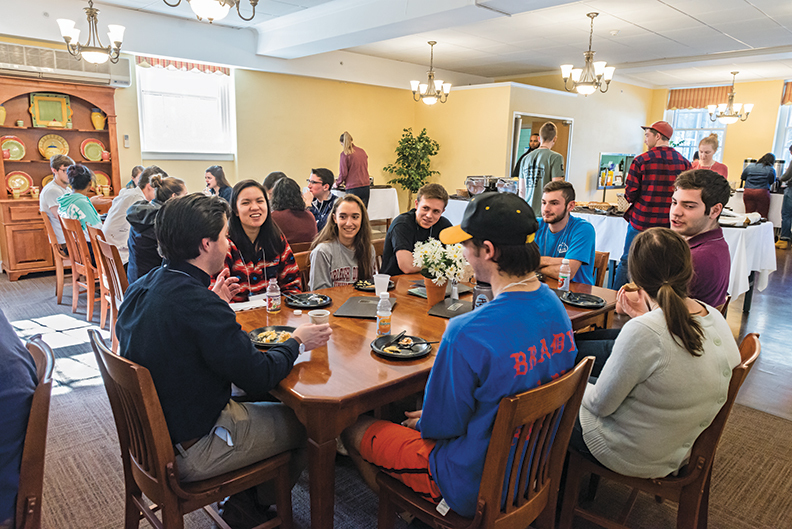 The conversations around eight oval tables were interrupted by Andrew Basler ’12, MA’18, a graduate assistant within Student Formation, who called the room to attention by striking a copper Tibetan singing bowl with a wood mallet. The small student groups became acquainted over chicken quesadillas, Spanish rice, and chocolate chip cookies. The group I joined for the weekend stuck to kibitzing about the generally un-admired housing lottery, the Gilmore Girls reboot, and a rumor about a secret tunnel between Gasson and Devlin Hall (in reality, a crawl space containing electrical lines and steam pipes). Four hours later, following three retreat meetings, they’d be sharing personal histories. The bowl chimed and we regrouped in what had been the estate’s main parlor, base camp for the weekend’s talks. Thirty-eight feet long and 24 feet wide, the room offers maple floors, oak paneling, framed 19th-century maps, three arched French double doors that lead to a terrace, a fireplace wide enough for a hibernating grizzly, and bookshelves packed with reminders of the house’s years as a priory (collections of the ecclesiastical journal Angelicum, a Depression-era source of canon law commentary, and of Review for Religious, published by the Missouri Province Jesuits). The students sat across three rows of portable chairs, while sweeps and Student Formation staff filled wing chairs against the back wall, and Sacco, who attends almost every Halftime, leaned back in a floral-patterned couch against an expansive bay window, out of the eye range of students or faculty and staff, his usual post. 7:40 p.m. Mary Troxell, an animated middle-aged woman who teaches German idealism in the philosophy department, introduced herself as Halftime 88’s emcee. She wore jeans, a half-zip fleece, and small hoop earrings. Her amber hair was bobbed. Leaning forward with her hands cupped on the dark-wood lectern in front of the fireplace, she looked like the director of a well-managed summer camp. She began by posing the first of the Himesian questions: “What brings me joy?” Troxell grew up, she told the students, in subsidized housing in unincorporated Pompano Highlands, Florida (she maintains a glimmer of an accent). “Embarrassed” by her family’s circumstances, she concocted an “escape plan” when she was in middle school: Earn top grades, then a lucrative job, and never return. But as an ambitious undergraduate studying long hours in the library at Amherst College in the late 1980s, Troxell developed a routine. She’d step away from her assigned reading every so often, pick a book at random from the library shelves, read for 15 minutes, then return to her work. “I fell in love with the life of the mind,” she told the crowd in the parlor. “That feeling of joy has served as a north star throughout my life.” As she would reveal the following day in her “Be Reflective” talk, it would take her years to make good on what she learned about herself as an undergraduate. Basler then flicked off the lights, and after a few moments Halftime’s guiding spirit appeared on a projection screen on a tripod at the front of the room. Michael Himes, a priest of the Archdiocese of Brooklyn, is a short, round man in large eyeglasses. In this video, now 16 years old, he is in his early 50s and dressed in a gray wool blazer over a burgundy V-neck sweater over a white shirt and gold necktie. While a Brooklyn native, his accent wobbles back and forth between outerborough and something nearly but not quite British. Over the course of the weekend, he will introduce the “Three Key Questions” in brief videos, beginning with joy. Himes began delivering his thoughts on the “Three Key Questions” when he taught at Notre Dame in the 1990s. Burt Howell, a long-time member of the Mission and Ministry staff and a principal designer of Halftime, recruited him for the videos in 2001, just after Himes arrived at Boston College. Howell booked a television studio in Cambridge for four days but, he recalls, Himes delivered three “Michael Jordan” level takes without rehearsal on day one. 9:15 p.m. Everyone returned from their small group discussions. As students took their seats in the parlor, the seven sweeps faced them in the front, seated with their backs to the fireplace. Most held “symbols of discernment,” objects they’d been asked to bring that tied to moments when they were required to make important life decisions. The objects were: a journal with a red and white polka dot cover, a bound undergraduate thesis from 1988 entitled “The Workers and Their World,” a lime green Beanie Babies frog, a mop, a red toy motorcycle, an “I Voted” sticker, and a ballpoint pen marked with the Boston College seal. Holding these objects, the faculty and staff sweeps—ages 27 to 70—looked like the world’s least likely improv comedy troupe. Bill Tibbs, for whom this was a first Halftime retreat, recounted the day he told his mother he was gay. He was 37, and had been living with his partner (now husband) for 15 years. He’d decided to tell her while on a visit to her home outside Washington, D.C. “I didn’t tell her during breakfast, or during her soap operas, or during lunch, or during her game shows,” he said. When he finally spoke at the living-room sofa before dinner, his mother answered, “I know. I was just waiting until you were ready and felt comfortable enough to tell me.” Soon after, he began to tell coworkers. “To live a whole life, you have to bring your whole self,” he said. A male student asked, What went through your head as you mopped? Nothing, said Robinette. That was the point. “The complete bodily investment in what I was doing allowed the deeper senses of what I wanted to do to come to fruition.” At the end of the year he applied to master’s programs in theology. He earned his doctorate at Notre Dame in 2003. Robinette’s story seemed to resonate strongly with the students, many of whom were no doubt contemplating corporate careers and perhaps wondering how their souls would find nourishment in the executive suite. 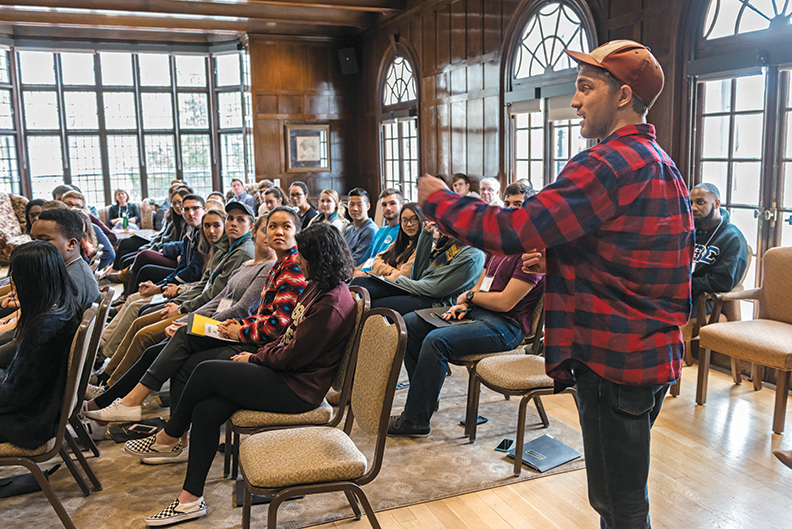 For the remainder of the retreat, students sought out Robinette in free moments, asking him about courses he would be teaching and whether he thought they should take a year away from studies before beginning graduate school. After briefly sharing their own symbols of discernment within their small groups, most students retired for the night; a handful made popcorn in the snack room or played Monopoly in the game room until after midnight. In November 1965, a month before the close of the Second Vatican Council, the University dropped the retreat requirement. 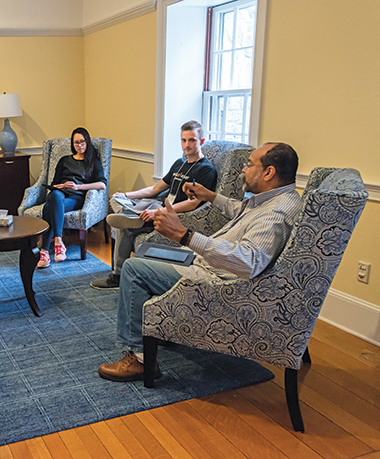 George Drury, SJ, director of “student personnel services,” issued a statement saying the University was confident that the curriculum sufficiently cultivated students’ “spiritual growth.” For the next 25 years, students attended sporadic, voluntary retreats. Then retreat culture bloomed in American Catholic educational institutions. In 1993, Mission and Ministry’s First-Year Experience office began 48Hours, a retreat to help “ease the transition” for freshmen from high school to college. 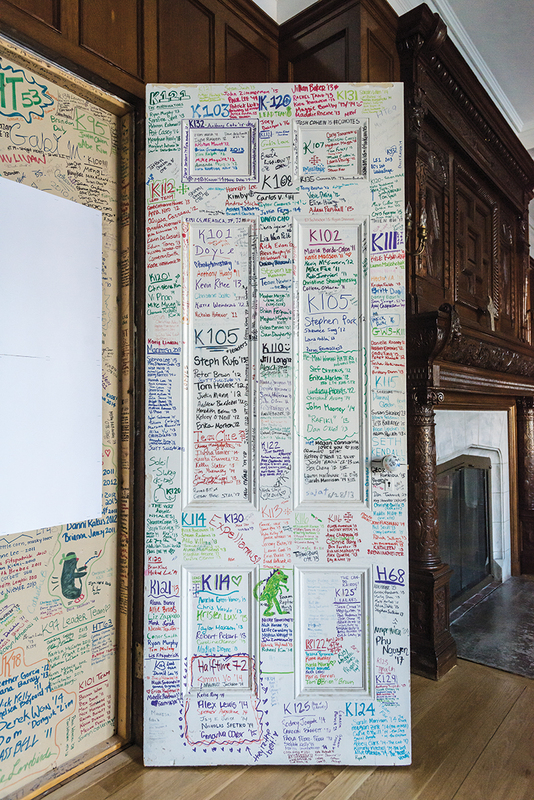 Between 600 and 1,100 first-year students continue to participate each year. 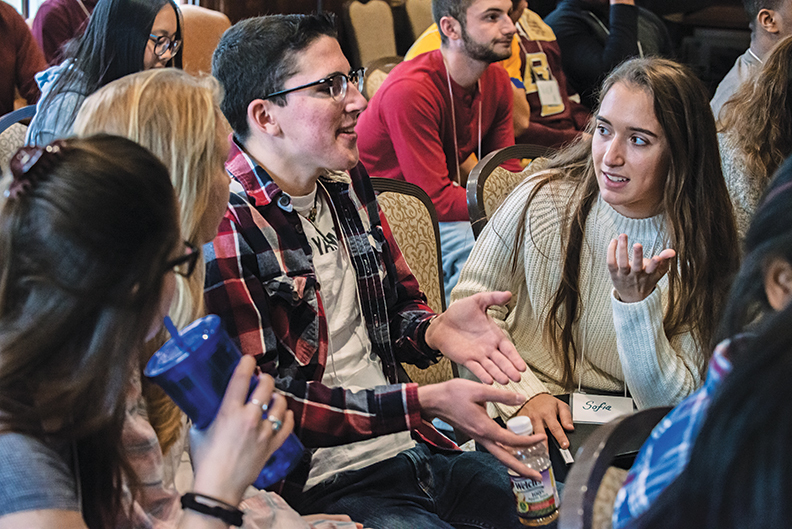 Around the same time, Kairos retreats began to proliferate in Jesuit high schools across the country. 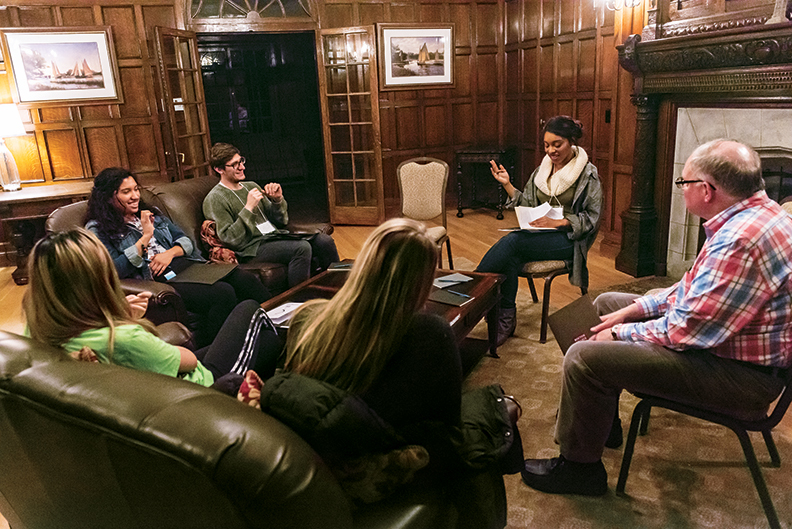 Centered on three days of peer-led conversation about “understanding God’s role” in one’s life, Kairos is now a graduation requirement at many Jesuit high schools. 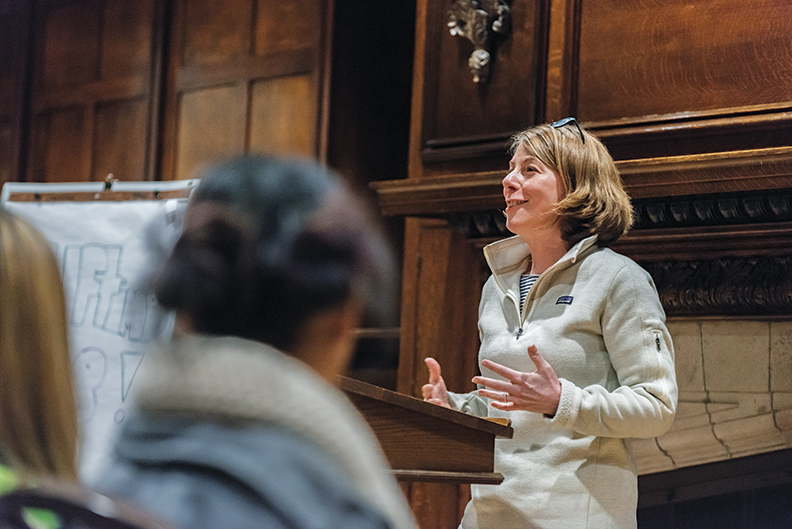 In April 1997, Kelly Muldoon ’99, a studio art major, organized the first Kairos retreat at Boston College. Today Campus Ministry sponsors a dozen Kairos retreats a year, each attended by some 60 students. 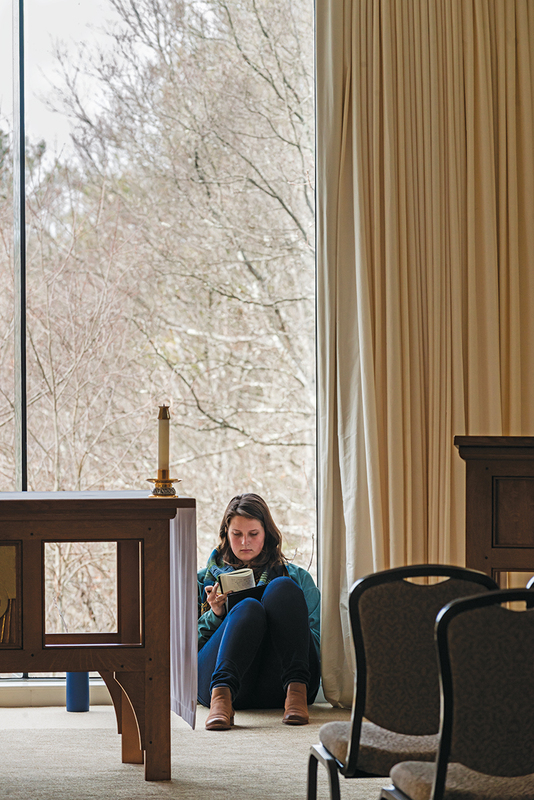 Campus Ministry hosts six other faith-based retreats, variously focused on such topics as “God’s unconditional love,” the Ignatian Spiritual Exercises, Lent, and issues related to freshman and senior life. 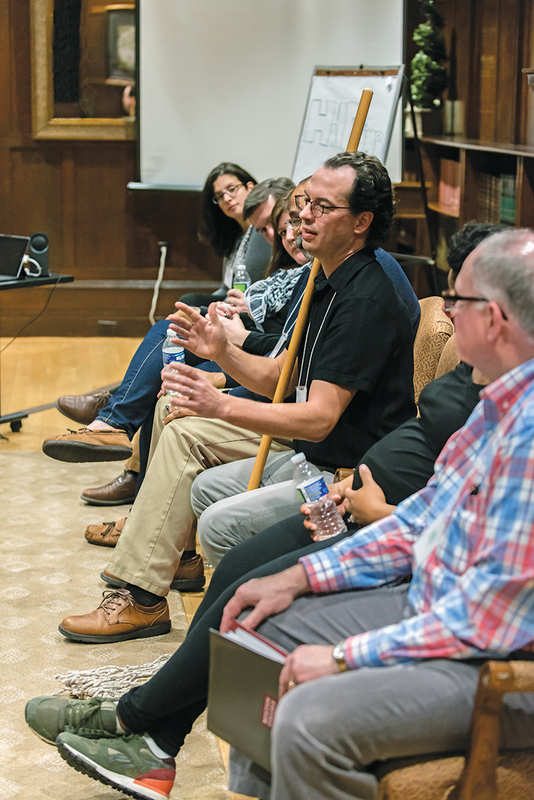 Other retreats, begun by the Center for Student Formation, focus on race, on sexual orientation, and, through programs such as the Freshmen League (for men) and Ascend (for women), on the freshman experience. 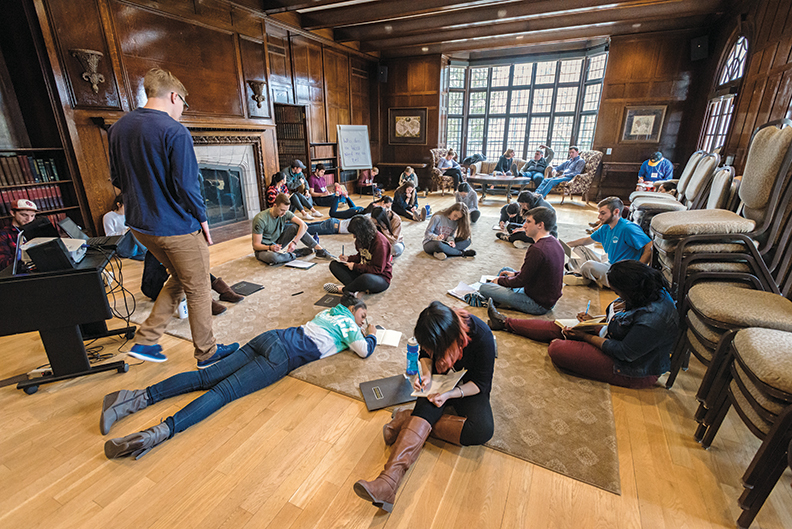 Afterward, students sprawled out on the parlor’s Oriental rug for the first of two silent journaling sessions. Some doodled, others reflected on what they’d heard from faculty and staff presenters: “Your monastery is in your heart” (Robinette, quoting his spiritual mentor). “The way forward is often by going back to your past self” (David Quigley). “All wisdom comes through suffering, and no man willingly becomes wise” (Troxell, quoting Aeschylus). “Don’t judge your insides by other people’s outsides” (Troxell, quoting her mother). Basler’s bowl rang, signaling an afternoon of free time. A few students approached sweeps for one-on-one conversations in two of the first-floor parlors. Others walked through the snowy woods to the Charles River. Eight sat on the staircase beside the main entrance, extending their small-group discussions. The rest continued to journal, or returned to their rooms. “I’ve never felt older in my life than I did when I was 26,” said Troxell. It was at that point, nearly five years into the job, that a friend asked her, Who the hell are you? The students returned to their groups to spend an hour talking about what was right for them. Dorrie Siqueiros offered seven words: “Venti Iced Americano with Sugar Free Vanilla,” her Starbucks order. At least once a week she meets close friends for coffee at 6:00 a.m. “The older you get, the busier you get, the harder it is to make friends,” Siqueiros told the students. Saturday, 9:00 p.m. The students gathered in the chapel for a “conversation partners” activity. They sat in concentric circles, each student facing another, each holding 10 personal photographs they’d brought to the retreat. For an hour, a student lead called out prompts every five minutes: If you could relive any of these moments, which one would it be and why? Which photo represents what you value most in life? What would you change about a certain photo? Meanwhile, sweeps and Student Formation staff gathered in a parlor on the second floor. They sat in lounge chairs and on sofas, drinking craft beer, pinot noir, or vodka-tonics, paying no attention to the March Madness game on the television, talking and joking. Some batted ideas for reshaping the theology core, bolstering the Women’s Center, and renaming course titles to attract Millennials. When the last of us shuffled to our rooms shortly after 1:00 a.m., the halls were silent. Tonight the faculty outlasted the students. Reflecting on the challenges of this final question, Tabitha Joseph ’17, a management, leadership, and music major from New Rochelle, New York, stood before the fireplace as a lead and said that during her first semester at Boston College, when the professor in her business ethics seminar asked who might be interested in consulting after graduation, she was the only student not to raise a hand. I had watched Joseph rehearse her presentation a week earlier in front of the other leads. She had rushed and her voice had quivered. Now she slowly paced back and forth, locking onto the students with her large, brown eyes. Joseph said that the day after she arrived on campus, her mother lost her job as a nurse’s aid. She babysat before class three mornings a week for two years and gave the earnings to her mother. Following her junior year, she interned at a global management consultancy. “Excel spreadsheets didn’t bring me joy. But being able to buy 3D tickets to Ice Age for my little brother did.” When the consultancy offered her a job, she hesitated; she’d much prefer to work for a nonprofit with a social justice mission. As she weighed her decision last October, a hurricane destroyed the houses of her grandmother and two aunts in Haiti. 11:15 a.m. We met in our small groups one last time, to reflect on what we’d take back to campus. In my group we learned that one student had called her parents the previous evening to say she was no longer sure she wanted to major in finance. It hadn’t gone well, she confessed, but she was relieved she’d had the conversation. Others said they planned to continue talking with faculty and staff sweeps, and to reach out to their professors about “decisions they faced at our age.” Most of the 45 minutes, however, filled up with silence, as though the students were no longer occupied with the retreat but with all that awaited them when they returned in a few hours to what they thought of as their real lives. The lead jotted down phone numbers, saying she’d arrange a follow-up meeting back on campus. On the surveys issued at the conclusion of each Halftime, 98 percent of participants report the retreat was “very much worth my time,” and students consistently rate the sweeps’ symbol of discernment panel above all other weekend’s events. They say that Halftime has left them feeling “more balanced,” that it helped them understand the error of making vocational decisions alone, that vocation means more than career, and that they feel more eager to reach out to faculty and staff. “In the best case scenario,” Burt Howell said, “a student returns from Halftime feeling restless.” Howell hopes that students seek out the conversation partners they met on Halftime; that they revisit the Himes questions on occasion. But the truth is that while Howell and Sacco know of individual students who’ve made prudent (and sometimes imprudent) changes in their lives as a consequence of the Halftime experience, they don’t know what long-term affect the weekend generally has. Like any other retreat, conference, exhibition, symposium, or course that a university designs for its students, Halftime is in the end a dense concentration of ideas, advice, associations, wisdom, jokes, turns of phrase, and stories from which students will draw what they want or need to know. It does not dismay Halftime’s leaders, as it does not dismay any seasoned educator, that they can’t know the results of their effort immediately or, in many cases, ever. What they can see from their perches at the edges of the Connors Center parlor is what transpires in the moment. And that’s enough for the moment.